We have a wide range of swimming pool cleaning accessories like suction sweeper with hose pipe, leaf rake, algae brush Telescopic handle, Test kits and swimming pool fittings accessories line overflow gratings, main drain covers, pool ladders, pool skimmers, pool nozzles fittings which ensures trouble free operation. Also, we are offering all types of swimming pool underwater lights (LED lamps and halogen lamps with its power supply units and electrical fittings). We have a high quality material that enhances the durability. We provide swimming pool fittings and accessories for Residential Pool, Public Pool and Competition Pool which are durable & efficient to pool water according to the design & client€™s requirements. All fittings and accessories are Emaux, Waterco and Astral make. • Our all product range is user friendly. • UV resistant high quality Stainless Steel 304 pool ladders available in 2 step, 3 step and 4 step. • Main drain cover available in rectangular and round shapes. • Non corrosive ABS / PVC pool nozzles and fittings. 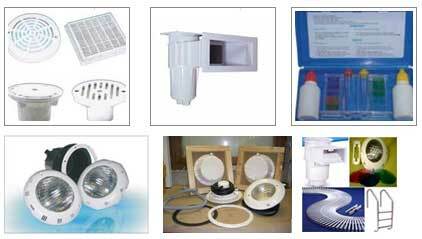 • High quality SS 304 or PVC housing for underwater lights. • ABS made standard wall skimmers and wide mouth wall skimmers are available.